I wish I had more time to spend in the kitchen in the middle of the week. I am so content when I am able to chop by hand instead of using a food processor. Normally midweek I return home just before 6pm. I am usually very hungry and you can only imagine how ravenous my 15 year old athletic son feels. I do not like to purchase convenient pre-made packaged foods, and for this reason I keep my Tuesday to Thursday dinners simple. Two or three ingredients, nothing too fancy, wholesome and satisfying. With all that said, this dinner fits well into a midweek menu. I understand the best pesto is hand made, not using a food processor. If you have the time it is well worth chopping this by hand. Otherwise, it is a very nice mid week “whirled in the food processor” dinner! For an extra creamy texture I added 4 ounces of soft goat’s cheese to this pesto. Put a large pot of water on the stove over high heat. 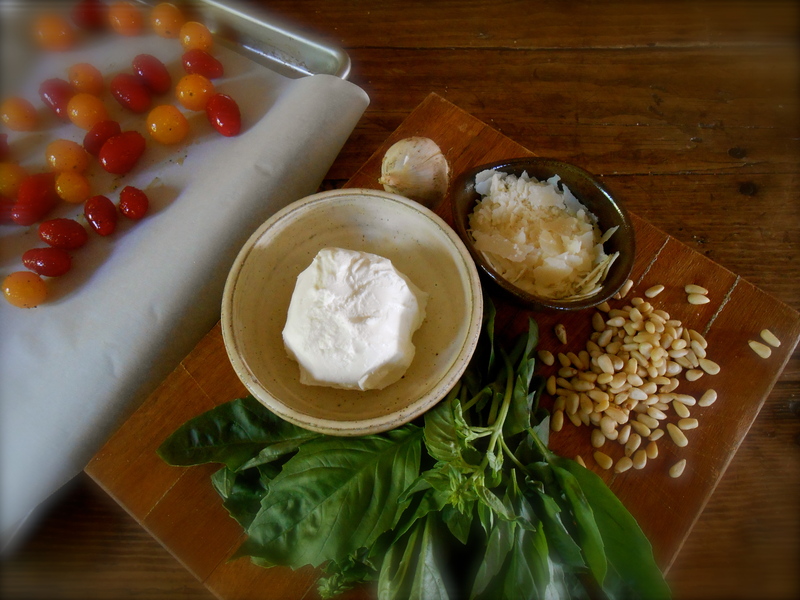 Prepare tomatoes for roasting and make the pesto while you are waiting for the water to boil. Toss tomatoes with olive oil and a pinch or two of salt. Place them on a rimmed baking sheet and roast in oven for approximately 20 minutes, depending on what size you are using. Once the skins are wrinkly and they look roasted remove from oven and set aside. Place all ingredients in a food processor and whirl until blended. Once your water is at a roaring boil add a tablespoon of coarse grain salt and drop your pasta in. I used one pound of linguine. Cook until al dente, linguine cooking time is approximately 9 minutes. Drain pasta, return it to the pan (off the heat) and toss with pesto. Divide into serving bowls and serve with roasted tomatoes and freshly grated parmesan on top. sound a grat comfort meals…. This is such a classic dish, it can be eaten cold or warm. Pesto is so flavorful and the tomatoes add another layer of flavor. Very nice. I agree. I did eat the little bit of leftovers the next day for lunch without heating it up. Hope you are doing well on your “diet” Suzanne! Your recipe is so simple yet has all the ingredients of a delicious and healthy dish. I feel the same way about midweek dinners. We need to come up with something quick and simple. I find that challenging and fun. And we get rewarded with a wonderful meal without much fuss! I like your idea of adding roasted cherry tomatoes to the pesto dish. Yummy! Thank you Dolly. I been checking your site for another one of your creative recipes! :) It is so nice to hear from you today. I put this on my chalkboard menu for later this week. Looks right up my alley! Simple, fast and extremely delicious dish. The plate looks beautiful! Looks like a great one to try with my always-ravenous teen sons! Oh, so you have teen sons too! :) Well, mine did enjoy this recipe, however, he seems to always want some sort of meat on the table too! Roasted tomatoes will be a fun change from our usual pesto pasta- thanks for the idea. Rock salt, is it the same as kosher? Wow! Looks light, refreshing and tasty. I just bought my tomato plants!!! Now the hard part…waiting! I will have to buy some tomatoes and try this recipe. Thanks for sharing! You welcome! I know…sometimes I can’t wait for my plants to produce so I just cheat and go out and buy it! Good call adding roasted tomatoes to pasta and pesto. Goat cheese in the pesto… what a fabulous idea! Your dish looks amazing… delicious! I know! I have made pesto too many times to count and this is the first time I added goat cheese and it was fantastic. You have to try it. I don’t think I’ll make it without from now on. 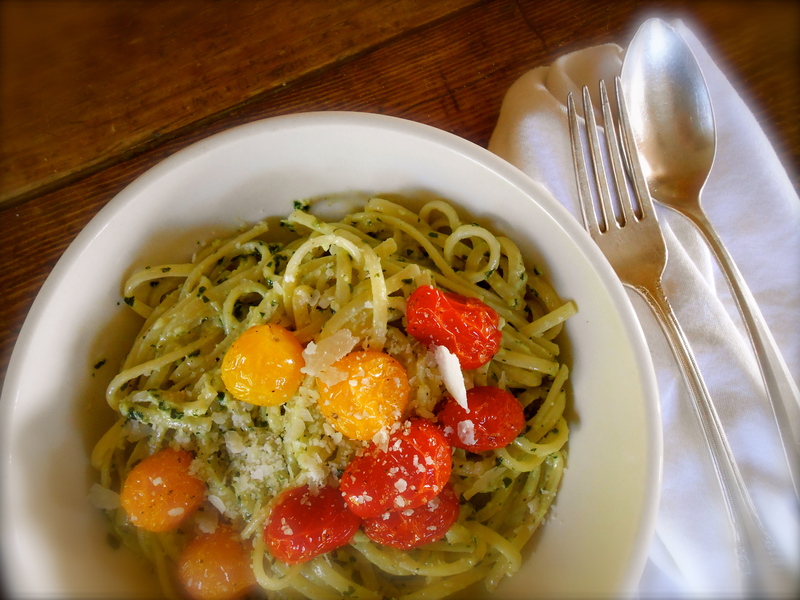 You are currently reading linguine pesto and roasted tomatoes (linguine e pomodori arrostiti) at COTTAGE GROVE HOUSE.